Uranta and Conga Mandinga are together bringing positive vibrations to communities in Mexico by taking the Stitches That Matter Atabal project to a higher level and proving that conscious consumption can make a real difference. 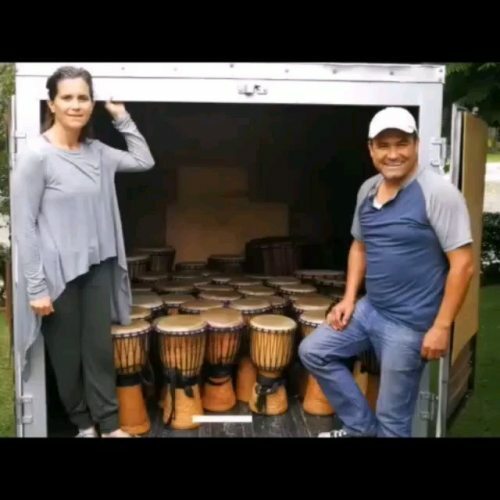 @Uranta has now donated our set of 45 Djembe drums to Cesar Juaregui’s Conga Mandinga, which has been taking drums into communities around Guadalajara desperately in need of positive vibrations. Generous support from all the purchasers of Uranta clothing has enabled this – and we all our beautifully conscious Tribe for their support !! The drums backstop a program that is funded on a day to day basis by the collection and sale of recyclable items – paper, plastic, glass – which means that the kids who want to participate empower the program with efforts to clean their immediate environment. Uranta Mindful Clothing – which makes all our leisure and yoga wear from upcycled fabrics – is absolutely thrilled that this program combines the love for the planet and the building of sustainable, vision driven communities. This program will continue indefinitely, as long as there is willingness to collect and sell recyclables to pay for teachers and other costs, and as long as Cesar’s passion keeps the drums singing.